This page is a translated version of the page Bird splat and the translation is 100% complete. 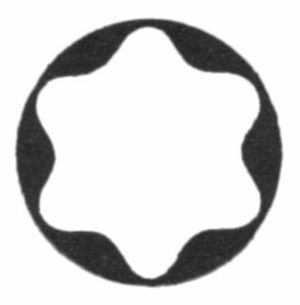 With bird splat indicates the nickname, used in a derogatory manner by those who do not appreciate the brand, to indicate the logo of the six-pointed star rounded that characterizes Montblanc production from 1914. The nickname aims to bring out the similarity of the logo, rather than the noble snowy peaks of Mont Blanc or the shapes of the delicate edelweiss (two of the images used in the corporate propaganda) to the form, much more prosaic, but perhaps really more like, that the remains of a bird feces rained down on the floor have. The nickname origins are unknown, but clearly they sink their roots in the strong antipathy that the company seems to collect from most of the antique pens collectors, especially those in the Anglo-Saxon world, an antipathy that stands out in a rather evident way in relief figures such as Frank Dubiel, author of a book on the techniques of restoration widespread among collectors, which is sometimes credited as the inventor of the nickname.